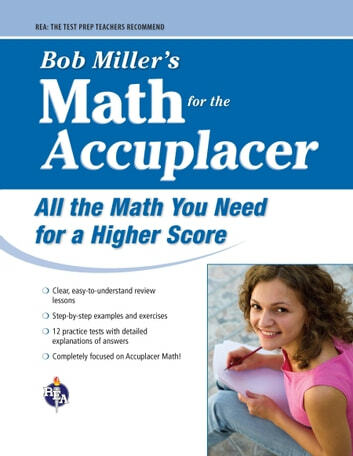 Get a Higher Math Score on the Accuplacer with REA’s NEW Bob Miller Test Prep! If you’re one of the millions of students attending community college this year, REA has the perfect Accuplacer test prep for you - Bob Miller’s Math for the Accuplacer. 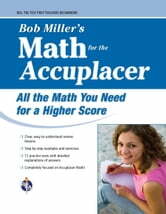 Written in a lively and unique format, ***Bob Miller’s Math for the Accuplacer***is an excellent tool for students who have been recently admitted to college and who want to improve their math skills before taking the Accuplacer exam. The book explains math concepts in a lively, easy-to-grasp style. Each chapter includes numerous step-by-step examples and exercises. Detailed explanations of solutions help students understand and retain the material. Bob’s targeted review section covers all the math topics tested on the Accuplacer, including arithmetic (17 questions on the test), elementary algebra (12 questions on the test), and college-level math (20 questions on the test). To help you get the most out of your Accuplacer preparation, Bob has included four practice tests for each section – for a total of 12 exams. Our test-taking advice, study tips, and exam strategies will prepare you for exam day, ease your anxiety, and help you boost your score. Packed with Bob Miller’s engaging examples and practical advice, this book is a must for any student preparing for the Accuplacer! The Accuplacer exam is used to determine which math courses are appropriate for newly enrolled college students. It is popular in community colleges and both two- and four-year schools.